Le projet Embraer C-390, déjà bien avancé devient ravitailleur KC-390. Une commande de 23 par la FAB dans les classeurs. Salué par Lokheed Martin au salon de Rio !! Embraer today launched a jet-powered military tanker-transport with a debut order from the Brazilian Air Force signed on the opening day of the Latin American Aerospace and Defense (LAAD) exhibition in Rio de Janeiro. substantially different. The military configuration include such major design changes as a high-wing, T-tail and aft ramp. and tanker aircraft for the FAB and shall also become another successful export platform for both Embraer and Brazil,” Frederico Fleury Curado, Embraer president and CEO, says in a statement. Although the FAB reportedly plans to buy 23 KC-390s, neither party has disclosed the terms of the deal in today's announcement. The FAB plans to launch the new transport fleet into service in 2015. Embraer officials have recently described a potential world market for 700 sales of the KC-390, largely replacing aging C-130 tubroprops with a jet-powered type. Ron Covais, Lockheed Martin's president of the Americas, acknowleges the KC-390 poses a competitive threat. "I’m sure it will be quality coming from Embraer," he said. "It will represent some level of competition to us." d'ici a ce qu'il décolle avant notre A400M....!!!!!!! Signature of a $1.3-billion contract to develop a military airlifter could not come at a better time for Embraer. With its commercial and business aircraft production hit by the global economic malaise, development of an all-new tanker/transport for the Brazilian air force will boost the manufacturer's defense business and offset the civil aviation cycles. "It's a brand new program for us, made in heaven," says CEO Frederico Fleury Curado following signature of the government-funded development contract at last week's Latin America Aerospace & Defense (LAAD) show in Rio de Janeiro. "It gives us the platform we need to fulfill one of our strategic objectives - to increase the relative contribution of defense." While the seven-year contract to develop the turbofan-powered KC-390 turbofan-powered military transport will not offset the current downturn in civil deliveries (see p. 26), or reverse February's 20% cut in the workforce, the program will help Embraer toward the goal of increasing its defense business to 20% of revenues, from 8% last year, says Orlando Ferreira Neto, vice-president for the defense market. Development of the KC-390 will also reshape the tactical airlift landscape, producing a direct competitor to Lockheed Martin's increasingly successful C-130J. Arguing that customers are looking for a proven, low-risk aircraft, the U.S. manufacturer questions whether its would-be rival is underestimating the task of developing a military transport capable of the full spectrum of tactical airlift and tanker missions. The KC-390 marks the largest and most complex aircraft ever undertaken by Embraer, and both the company and its competitors say the program will be a challenge, particularly in light of the delays to the Airbus A400M military airlifter and the time it took Lockheed Martin to achieve full operational capability with the C-130J. Although the air force will fund development, any delay would cripple Embraer's defense growth. Competitors also question whether $1.3 billion is enough to create an all-new military transport. Airbus has received more than $5 billion toward the A400M, and the aircraft has yet to fly, while it cost Lockheed Martin $1.2 billion to bring forth a derivative of its long-established C-130. Neto says the KC-390's development cost is "reasonable" given Embraer's experience, adding "we are comfortable with that number." The KC-390 is part of a strategy by the Brazilian government to strengthen its defense force and industrial base. Other programs include the F-X2 competition for up to 120 new fighters, local manufacture of 50 Eurocopter EC725 transport helicopters, construction of a nuclear submarine with assistance from France, and an accord with French space agency CNES to develop Brazil's satellite and launch vehicle capability. Embraer first unveiled its C-390 concept for a military airlifter at the 2007 LAAD show, but the aircraft now on the drawing board for the air force - and the program's structure - is very different to that envisioned back then. The original idea was to design a "quick and simple" derivative of the Embraer 190 large regional jet at a projected cost of $600 million - $400 million from the Brazilian government and the rest from the company and its risk-sharing partners. "It was not a realistic aircraft," says Curado. Instead, says Neto, the C-390 concept served to provoke discussion with potential customers and solicit input that changed the blueprint substantially. The aircraft is no longer a derivative of the 190 - "The only thing they have in common is the 9 and the 0," - and totally funded by the Brazilian air force. The KC-390 is a "sovereign program," says Curado. Any decisions involving taking on other companies or countries as risk-sharing partners will be made by the air force and government as a national strategy, he says. Talks with other countries on participation will take place over the first two years of the program. To reduce risk, the program is divided into four phases, each with deliverables. "There are lots of milestones to keep the technical and economic risk mitigated," says Neto. The initial 12-month study phase will freeze the basic configuration, with the final design to be frozen by the end of the second 12 months, at which point all suppliers and partners are to be selected so that the year-long joint definition phase can begin in the 25th month of the program. The final phase involves detailed design, construction and flight test of two prototypes, certification of the KC-390 to U.S. FAR 25 transport-category regulations, and tooling up for production. The airlifter is scheduled to fly in 2013 and enter service in 2015, with the Brazilian air force expected to place an initial order for 22 aircraft. The KC-390 has been shaped by air force requirements to replace the C-130, and is larger than the original C-390 concept. The aircraft has a takeoff gross weight of 72 metric tons, with 22 tons of fuel in the wing and a 19-ton payload - similar to the C-130J's and about half that of the A400M's, both of them turboprops. The KC-390 will be equipped as receiver and tanker, with the ability to carry 9.5 tons of additional fuel in palletized tanks in the cargo hold for the refueling mission. Powered by two 27,000-lb.-thrust turbofans, the KC-390 will be able to take off in 1,100 meters, cruise at 36,000 ft. with a maximum speed of Mach 0.8, and fly 1,500 naut. mi., fully loaded, increasing to 3,000 naut. mi. on a ferry mission. Neto says the cargo hold will be 20-25% larger than competing aircraft, with a flat floor and no height restrictions. Brazilian air force requirements include the ability to operate from short unpaved runways and land on ice. The KC-390 will be fully fly-by-wire, but the balance of metal and composites in its structure is still being decided jointly with the air force. The KC-390 will compete head-on with the C-130J for export orders. Lockheed Martin is already planning to increase production to 24 aircraft next year, twice the 2008 rate, to meet existing and expected U.S. and international orders. Embraer anticipates a total market for 700 tactical airlifters over 15 years. "Their assessment of the market is larger than ours, but we still believe it's a good market," says Jim Grant, Lockheed vice-president for air mobility programs. "We see a market for 200-plus aircraft over the next 10 years," he says, driven by growing demand for airlift for military and humanitarian missions. Still to be ironed out is whether Embraer will integrate the KC-390's avionics, a role the company has previously subcontracted. "That is one area of risk mitigation to be decided," says Neto. "Embraer's objective is to be the lead on system integration and it is a requirement of the Brazilian air force that the knowledge be retained in Brazil." Neto says Embraer "placed a bet" when it laid off 4,200 employees that the KC-390 contract would be signed, and did not reduce its engineering workforce. Employment on the program is expected to grow gradually to 2,000 people, with the build-up coinciding with the completion of development work on the Phenom light jets followed by the Legacy 450/500 mid-sized business jets. Curado says the scale of the KC-390 engineering effort would not preclude Embraer from launching development of a larger commercial aircraft. The company is studying both new and derivative designs with up to 150 seats and expects to make a decision in the next 18-24 months, he says. The airlifter, slated to be built at its Gaviao Peixoto plant, will give the company valuable experience with a large aircraft, he says. With the A400M delayed by three years, and the C-130J poised to mop up orders from disaffected customers, Embraer is entering the military airlift market at a critical juncture. "We are aware that this is a challenge for us, and over the last couple of years I have put a lot of effort into making sure we have a sound aircraft concept and a sound program structure," says Curado. L'annonce de l'achat par la France d'une douzaine d'Embraer KC390 au Brésil a créé la surprise. D'abord parce que l'avion n'existe pas encore. Le programme n'a été lancé qu'en 2008, avec une première commande en avril 2009. L'avion ne devrait pas entrer en service avant 2015. Autant dire qu'il ne devrait pas être opérationnel dans l'armée de l'air française avant la fin de la prochaine décénnie, dans une dizaine d'années. Le KC-390 sera un avion de transport militaire, doté de capacités de ravitaillement en vol. Son poids maximum au décollage devrait être de 72 tonnes, soit nettement plus qu'un C-160 Transall (51 tonnes), mais comparable à celle d'un Hercules C-130. Sa charge maximale sera de 19 tonnes, avec une porte-cargo à l'arrière. Les dimensions de sa soute sont inconnues. Les dimensions de l'avion sont de 33,4 m (longueur), 33,9 m (envergure), 11,4 (hauteur), à comparer à celles du Transall : 32,4 x 40 x 11,7. Le KC 390 sera propulsé par deux réacteurs turbofan, qui pourraient être des Pratt-Whitney PW6000 ou des Rolls-Royce BR715 (poussée comprise entre 75 et 100 kN). L'arrivée de cet avion risque de poser des problèmes à l'armée de l'air, qui verra se constituer une micro-flotte. A la date prévisibible de livraison, la flotte de transport serait composée de quatre types d'appareils, le Transall étant en principe retiré : C-130, Casa, A400-M (si tout va bien...) et KC-390. Chaque flotte nécessite de former spécifiquement des équipages et des mécaniciens, sans compter les flux d'approvisionnement en pièces détachées. D'autant que l'armée de l'air ne conserve pas un souvenir ému du Tucano, avion d'entrainement brésilien qu'elle vient de retirer du service, sans regrets particuliers. Cette commande est une pierre dans le jardin d'EADS et d'Airbus, incapables de livrer à temps et au prix attendu l'A 400M. C'est Dassault, la maison rivale, qui devrait aider Embraer à développer le KC-390. Reste maintenant à voir ce que sera vraiment ce KC-390. L'industrie canadienne, particulièrement quebecoise, compte bien participer à ce programme d'Embraer. On peut compter sur Héroux-Devtek pour le train, Sonaca Canada pour des panneaux d'aile ou autre, CMC Électronique pour des sytèmes électroniques de gestion de vol, et d'autres. Sachant qu'Embraer devrait choisir les fournisseurs cette année. (Montréal) Après avoir raflé la moitié du marché des biréacteurs régionaux et fait sa place sur le marché de l'aviation d'affaires, Embraer s'attaque au marché des avions de transport militaires avec le KC-390. L'industrie aéronautique québécoise veut monter à bord. Les chances sont excellentes. Déjà, Embraer fait affaires avec plusieurs fournisseurs québécois pour ses appareils régionaux et ses avions d'affaires. En fait, l'approvisionnement en provenance du Canada représente de 20 à 25% de l'approvisionnement total de l'avionneur brésilien, soit 500 millions de dollars par année. Les entreprises québécoises auront l'occasion de se faire valoir: au cours de la première semaine de février, une délégation du département de l'approvisionnement d'Embraer sera à Montréal pour rencontrer des candidats. C'est toutefois Embraer qui fera le tri et qui choisira quelles entreprises rencontrer à partir des profils envoyés. Embraer avait fait savoir en 2007 qu'il entendait fabriquer un avion de transport militaire à partir de l'E190, son plus gros biréacteur régional. L'avionneur brésilien a toutefois réalisé que l'appareil ne serait pas satisfaisant. Après avoir discuté avec les clients potentiels, et notamment avec les forces aériennes brésiliennes, Embraer a lancé en avril 2009 le KC-390, un appareil plus gros, totalement nouveau, qui entrera en compétition avec le légendaire avion de transport Hercule C-130 de Lockheed Martin. Le Brésil s'est engagé à commander 22 appareils KC-390 alors que la France a annoncé son intention d'en commander de 10 à 12, en contrepartie d'une commande de 36 avions de combat français Rafale passée par le Brésil. Embraer entend identifier les fournisseurs du nouvel appareil au cours de l'année 2010. «C'est le bon moment», lance M. Saada. Héroux-Devtek, un manufacturier de trains d'atterrissage et d'autres composantes pour l'industrie aéronautique, a déjà fait une proposition à Embraer. Héroux-Devtek est déjà un fournisseur d'Embraer. L'entreprise de Longueuil travaille présentement sur la conception des trains d'atterrissage des deux plus récents biréacteurs d'affaires de l'avionneur brésilien, le Legacy 450 et le Legacy 500. De son côté, Sonaca Canada est un fournisseur de longue date d'Embraer. L'entreprise de Mirabel fournit notamment les panneaux d'aile des plus gros biréacteurs régionaux de l'entreprise, l'E190 et l'E195, et du Phenom 300, un nouveau biréacteur d'affaires léger. «Embraer représente 25% de nos revenus», indique le chef de la direction de Sonaca Canada, Philippe Hoste. Il rappelle que la société mère, Sonaca, a été une des premières entreprises internationales à croire aux projets d'Embraer et à devenir un partenaire lorsque le fabricant s'est lancé dans l'aviation commerciale. CMC Électronique, qui fabrique des organiseurs de vol électroniques pour les biréacteurs régionaux E170 et E190 d'Embraer depuis quelques années, cible également le KC-390. Les plus petites entreprises québécoises sont également intéressées à monter à bord du gros appareil militaire d'Embraer. DCM Aéronautique, une entreprise de Boisbriand qui compte 37 employés, a déjà obtenu un contrat pour fournir des outils d'entretien pour le Phenom 300. Elle est également en voie d'obtenir un mandat pour le Legacy 450. «Ça nous place en bonne position pour le KC-390, mais il faut livrer la marchandise», note le président de DCM, Mario Lépine. Il explique que rien n'est jamais gagné. «Ce qui nous a permis de décrocher le contrat du Phenom 300, c'est l'insatisfaction d'Embraer face à l'entreprise qui avait remporté le même genre de contrat pour le Phenom 100», explique-t-il. 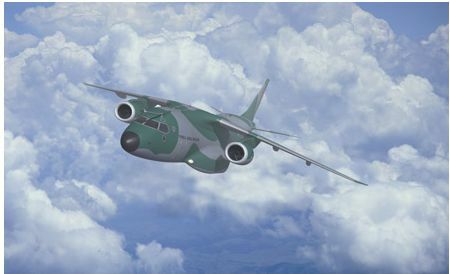 Embraer aims to select industrial partners by mid-next year for the Embraer KC-390 medium-lift military transport. This is because the joint-definition stage is mid-next year, says Embraer executive VP defense market Orlando Neto, adding that Embraer is now in the preliminary definition phase. Embraer aims to have four to five industrial partners, says Neto. Industrial partners will be those countries that get a share of the work on the programme in return for placing an order for the aircraft. When asked what type of work he envisages industrial partners doing, Neto says it could be parts for the airframe such as the tail and systems such as the landing gear. Embraer has already issued request for proposals and requests for information with regards to key systems such as the engines and avionics, says Neto. The Brazilian aircraft-maker is launching the KC-390 with the backing of the Brazilian Air Force. Its air force needs KC-390s because it has at least 30 Lockheed Martin C-130s that will need to be replaced eventually. The Brazilian Air Force order will be larger than 30 because the KC-390 is designed to do a number of different missions, says Neto. In addition to being a military transport, there will also be variants of the KC-390 that will be aerial tankers that can refuel fighter jets and helicopters, says Neto. Embraer aims to have the first prototype start flying in 2013 and get the operational clearances approved in time so the first aircraft can be delivered to the Brazilian Air Force in 2015, he adds. Le KC390 est en phase d'étude préliminaire. Embraer recherche de partenariat industriel qui seront scellés en milieu d'année prochaine à l'achèvement d'une phase appelée "joint-definition stage" ou l'on peut comprendre que les différents partenaires pressentis réfléchissent ensemble sur les éléments de l'avion défini à l'issue de la preliminary definition phase. MUNICH — The first fuselage has been joined for India’s airborne early warning aircraft, according to Embraer. What’s more, Embraer also reports its KC-390 tanker/transport development is holding to schedule. A full-size mockup of the cargo compartment to be used for ground tests with real payloads should be finished soon. Preliminary design activities are continuing, and supplier decisions are being made—including an engine choice. First flight is due in 2012. Overall, Embraer reports that “the defense market shows a scenario that is favorable for growth, with a series of campaigns underway in terms of transportation for officials and authorities; training and light attack; intelligence, surveillance and reconnaissance systems; aircraft modernization; military transportation; and systems and services.” Defense sales in the first quarter came in at $189 million, up from $67.8 million for the first three months of last year. Several military upgrade programs also have started to gather pace during the first three months of the year. “The test campaigns of the first prototype of the AMX, for the A-1M modernization program, started at the beginning of the year, and in January 2010 Embraer received the first A-4 fighter, at Gaviao Peixoto, from the Brazilian navy for its modernization project,” Embraer says. In January, Panama took delivery of a Legacy 600 business jet for government use, and the Ecuadorian air force received an initial batch of four Super Tucano trainer/light-attack aircraft. Ecuador is buying 24 of the aircraft. Qui d'autre ? le RB282 ? Au fait a t'on des nouvelles du rafale Brésilien ? Et vu la place sous l'aile haute ! Ben c'est un parfait candidat pour le PW GTF du série C ! Les EIS collent bien, de plus ! Ou de tout autre candidat à la remotorisation des monocouloirs pour un peu plus tard ! LeapX ou RB282 ou un mix IAE ! Et se gagner au passage 10-15 % d'autonomie, car ils sont un peu short à ce niveau, avec 19 Tonnes ! Embraer comes to the 2010 Farnborough air show with development work well under way on its biggest and most ambitious project to date - the KC-390 tactical transport. The Brazilian manufacturer is using the show to step up its hunt for new customers, as well as strategic industrial partners and suppliers. Currently in the initial definition phase, the aircraft is being developed under a Brazilian air force contract worth $1.3 billion, signed in April 2009. Embraer has its work cut out to convince sceptics that it can develop the aircraft to specification for such a relatively paltry sum, while avoiding engineering problems of the kind which beset Airbus Military's A400M. The Brazilian air force contract calls for the construction and certification of two KC-390 prototypes, plus associated production tooling. "With that amount of money, we will be conceiving, developing, designing and producing two prototypes, and having the tooling to certify those two prototypes to Part 25 and having all the tooling and assembly jigs ready for production," says Orlando Neto, Embraer executive vice-president defence market. He adds that series production is not included in the contract. The air force is expected to eventually order around 30 production KC-390s, designed to support a multitude of roles including humanitarian missions, rapid mobilisation, special forces operations, air dropping of paratroops, air-to-air refuelling, airborne cargo delivery, medical evacuation, search and rescue and even firefighting. Conceived as a jet-powered replacement for the Lockheed Martin C-130, the KC-390 is designed to be operated from semi-prepared airstrips with holes up to 40cm (15.7in) deep, and will also be used to support the Brazilian air force's operations in Antarctica. "Antarctica was one of the critical tasks that dimensioned the aircraft in the end," says Neto. The KC-390 is configured to carry a payload of 19t, cruising at Mach 0.8 at an altitude of 36,000ft (11,000m). It will accommodate 23.4t of fuel in its wing tanks and carry an additional 14t of fuel in the air-to-air refuelling role. The fuselage will withstand a pressure differential of 0.52bar (7.6lb/in2), which Neto says will provide a "very comfortable environment for soldiers, for this type of aircraft". He adds that the KC-390 will carry "in excess" of 64 parachutists or 80 soldiers. "It is designed to be superior to the C-130," says Neto. "The Brazilian air force could have purchased the C-130J, but this aircraft will do more for less, so that's the challenge we have ahead of us. It's as simple as that. We have a contract to produce a product that will do that job." The KC-390's cargo deck will be 17.8m long, 3.45m wide and 2.9m high (uninterrupted by the wing box). On a ferry flight the aircraft is designed to fly 3,350nm (6,200km), or 1,450nm with its maximum 19t payload. Maximum fuel and an 11t payload gives a range of 2,800nm. Neto says the KC-390 has to be jet powered because, given the size of the country that the Brazilian air force is charged with defending, "it has to be fast". However the air force also insists that the aircraft be able to take off or land wherever a C-130 can. "It will land and take off from airfields that are two classes below the C-130J and [Airbus Military] C-295," says Neto. Despite having a huge amount of airspace to patrol, the Brazilian air force constantly grapples with a tight procurement budget, and Neto says this could work in Embraer's favour when it comes to addressing export markets. "If there is one thing that Embraer Defense is blessed with, it's to have the Brazilian air force as a customer," says Neto. "They are very creative people with a small pocket and a big mission. That means that you have to be creative. "Look at the Bandeirante, the Tucano, the Super Tucano, look at all the products we have developed for them. The ERJ-145 ISR was initially invented for surveillance of the Amazon. They were made to be affordable. With this in hand, you have a good chance of having export success." Neto sees a conservative potential market for the KC-390 of 700 units (a figure which discounts the possibility, for example, of making a sale to the US Air Force), out of a global C-130 replacement market of 2,800 aircraft. "This is a product that puts us in a new league," says Neto. "Geopolitics can play a big part pro and against us of course, but we are pretty comfortable that this is a highly addressable market for this type of product." The fly-by-wire KC-390 has 52% more wing area than Embraer's current largest product - the 190/195 airliner. Its maximum take-off weight of 72t is 40% higher than that of the E-195. "We are just finalising the preliminary design phase as we speak," says Neto. "Then will come the initial definition phase, the joint definition phase, the detailed design, and building and certification of the prototypes. "The initial definition phase is where suppliers and strategic partners will be defined and put on board, because they need to be here for the joint definition phase. Now is the time up until May next in which we'll be seeing movement in terms of suppliers and strategic partners being announced." Neto says Embraer is open to a foreign government - and that country's local industry - participating in the programme, with the agreement of Brasilia. "They will be more than welcome to come, provided that the non-recurring costs that are embedded into this $1.3 billion contract are taken from Brazil and taken to them for them to spend. "We want as many strategic partners as possible, because to be on board you have to take the non-recurring costs and you have to commit to buy the KC-390 in the future. "If there is a decision for an air force and a local industry to participate, that is a government-to-government decision. Purchase of the KC-390 is at the air force level and participation of the local industry in doing part of the job is at the industrial level. A handful of countries would be fine." Metal for the first KC-390 is due to be cut by mid-2013. The initial prototype is scheduled to emerge in mid-2014, with the certification campaign getting under way in the third quarter of that year. The requirement for the as-yet unselected engine is "more than 25,000lb [110kN] and less than 30,000lb thrust", says Neto. "We're in discussions with the engine manufacturers. The idea is to have as much proven technology as possible. We're not reinventing the wheel here." The French government has indicated its willingness to purchase 12 KC-390s if Brazil selects the Dassault Rafale for its F-X2 fighter contest. "We do see opportunities for the C-390 in France, period," says Neto. "If somebody wants to tie those things together, we'll I'm not tying anything together. You don't buy something you don't need." Sweden has also made a similar pledge, linked to its offer of the Gripen NG. The Brazilian air force is looking for "high 20s or low 30s" in terms of number of aircraft, including air-to-air refuelling variants. "We have completed the final subsonic test of the preliminary design phase, in Holland," says Neto. "We finished the preliminary design phase with a product that we are pretty much confident is robust, complies with the mission it is being designed for, and will be very simple in terms of systems, and to operate." Three workshops with air forces (similar in format to the airline advisory boards formed by Embraer for its new airliner programmes) have been held, one for general configuration, one focused on the cargo compartment, and one for the maintenance of the aircraft. The KC-390 has been designed to offer a high level of survivability. "The distribution of systems through the aircraft has to be designed in such a way to ensure the aircraft has the level of survivability necessary for it to do the mission," he says. Neto is confident that the KC-390 programme will not suffer similar difficulties to those encountered in Europe with the larger A400M. "This is one product to be developed to fulfil a certain specified mission for one customer," says Neto. "That keeps things very, very straightforward. "To develop this programme we will have to overcome technical difficulties, learn a few things that we don't know for sure, but that's part of the challenge. We don't want to develop technology out of this, we want to get the aircraft serving the requirements of the Brazilian air force at the end of the development phase. "Mitigating the risk means having a customer, a contract to get the plane, which will come with its challenges, but no extra technology. We want to be safe because the application and the requirements are there." Pour 1.3 milliards ils sont censés avoir 2 protos+ l'outillage ! A priori le train va être ultra portant... sur les terrains très mauvais il est censé être meilleur que les C295 et C130. Brazilian Air Force Chief Lt Gen Junito Saito signs letter of intent to acquire 28 Embraer KC-390 tanker-transports during this press conference at the Farnborough Air Show on 21 July. Question de priorité... le FX2 attendra peut être. C'est bien, tout le monde fait pareil ! De fait je pense au P&W GTF, il y a la place sous l'aile, et c'est pile dans les puissances ! Bon, il y a aussi les LeapX, et même peut être RR qui pourrait se réveiller .... et descendre de l'étagère de la flexibilité un RB282! Les étagères de RR doivent s'approcher de la rupture à force de soutenir tant de projets on the shelf ... la flexibilité des planches pouvant avoir atteint ses limites ... si RR ne les décharge pas un peu grâce à une mise en route de projets ou lancements réels et tangibles ! Un nouvel avion pour dans 6-7 ans, avec des moteurs du siècle dernier ! Autonomie et performances ... obligent ! Et pourquoi pas continuer avec les CF34 ! Embraer s'est fermement déclaré open pour toutes les nouvelles motorisations ! Y a bien des tankers qui vont voler avec des CF6... ou des PW4000 même pas advanced ? C'est un cargo tactique avec un rayon d'action très court... 1450 Nm avec 19t de CU, ça fait 3h de vol non ? Ca rend le paramètre conso moins important non ? Pas vraiment pour l'export ! Et pour moi Cellule neuve = Moteurs récents ... pour durer 20 ans ! CFaussi les Transall en France, au bout du rouleau ! Je pense aussi qu'il faut des moteurs récents pour un avion nouveau sinon il sera vite dépassé. Au début il devait avoir l'aile et les moteurs de l'E190. Aujourd'hui les caractéristiques ont changé et la charge utile est passée à 23t. Mais pour moi les CF 34 tiennent toujours la route et Embraer les connaît bien ce qui peut être un vrai plus. Embraer recherche un moteur de 29000 lb de poussée. J'ai vu ça sur Aviation Week récemment. On a le choix entre le CFM56 et le V2500 car Embraer a prévu le premier vol en 2014 et l'EIS en 2015. Selon moi, avec toutes ces nouvelles spécifications (dimensions, MTOW, charge utile, etc. voir actu sur Aeroweb) le choix de moteur est quasi dans la boite et ce sera annoncer bientôt. Mais de plus .... je doutes qu'ils tiennent les délais annoncés, vers 2016 + me paraîtrait plus raisonnable et ils auraient CFMI et P&W en NG ! Dommage que Embraer soit devenu anti-turboprop ! 2 TP400 auraient peut être fait le boulot ! Suis un peu surpris de la pêche demandée, adieu CF34 ! Extrait du lien Aweek ! ! Embraer is looking for an engine in the 29,000-lb.-thrust class to power the 33.92 meter-long, 35.05 meter-wingspan military aircraft now in its early design phase. The Brazilian aircraft maker was looking at the CFM International CFM56 and the International Aero Engines (IAE) V2500, but Orlando Neto, the company’s executive vice president for the defense market, says the issue is no longer so straightforward. With CFM International now focused on the Leap-X design for the Comac C919 and other applications, and the long-term future of the V2500 production line potentially in doubt because of differences on the road ahead between IAE consortium members Pratt &amp;amp;amp; Whitney and Rolls-Royce, Embraer is reassessing what it wants to do. As part of that, Embraer is exploring whether it needs to shift its focus on the Leap-X offering and the Pratt &amp;amp;amp; Whitney geared turbofan. The concern is not so much about the near-term KC-390 development phase. However, Neto says the Embraer aircraft is supposed to be in production for a long time, and the company does not want to pick an engine that will be out of production for commercial purposes 10 years from now. The decision is also key because the selected engine maker would be one of the main risk-sharing partners on the development endeavor. Tu as raison Poncho, mais je ne crois pas que les Brésiliens ambitionnent de faire aussi sophistiqué ! Et surtout ... pas trop cher, pour l'export ! Et pièces détachées au coin de la rue si possible ! C'est la force des CFM 56 ou du CF34 tu trouves des PD eet des MRO partout ! C'est pour celà que RR fait beaucoup d'efforts sur le sujet, aussi !